My recent travels through Tuscany have awarded me the opportunity to taste a few additional wines that I would otherwise review later in the year. I decided to send these off for publication now. The following report includes a small group of wines, but there are a few gems hidden within. I wanted to draw your attention to three producers in particular. The second group of interesting new releases comes from Swiss-born Thomas Bär. I tasted the wines of Gagliole with Thomas over lunch in Rome at the end of March. The three wines tasted are all IGT expressions, although the single-vineyard Pecchia could stand among the top wines of the Chianti Classico (and Chianti Classico Gran Selezione) appellation. I loved the purity and the glossy luminosity of these wines. 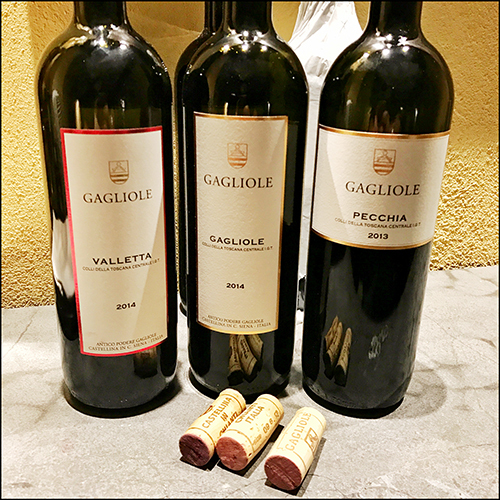 Gagliole makes a Sangiovese/Merlot blend called Valletta and a Sangiovese/Cabernet Sauvignon blend called Gagliole, in addition to his Sangiovese-based wine Pecchia. His portfolio includes a value red and whites. The estate has two vineyards in the Chianti Classico appellation and it is a lot of fun to trace the sourcing of fruit for each wine. The top fruit, from the Conca d’Oro vineyard in Panzano, goes to Pecchia. We tasted the wines at a new restaurant in Rome called Per Se run by chef Giulio Terrinoni. The food selection sees classic Roman dishes prepared with seafood. The menu is all a bit counterintuitive. One of the highlights was a plate of spaghetti cacio e pepe served with fresh anchovies. The pairing was delicious with the bright acidity of Sangiovese matched perfectly to the robust flavors of the pasta and cheese.